Illia Nyzhnyk won the U.S. Open Blitz Championship. 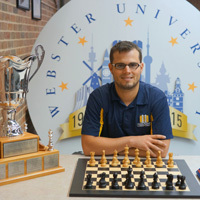 Webster University chess team members won the 2016 U.S. Open Blitz Championship and the U.S. Open G/15 Championship, which were sponsored by the U.S. Chess Federation and held in Indianapolis. The U.S. Open Blitz Championship was won by Illia Nyzhnyk, the youngest grandmaster in the Susan Polgar Institute for Chess Excellence at Webster. Fellow Webster student and grandmaster Vasif Durarbayli won second place in the field of 106 competitors from around the country. The U.S. Open G/15 Championship winner is Webster University student and grandmaster Fidel Corrales Jimenez. Twenty-three players competed. Not only do SPICE players continue to dominate the college chess scene over the past four years, with four consecutive President's Cup championships, but they also win world-class professional tournaments. 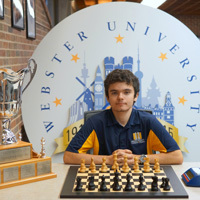 Since Webster University started the SPICE chess program in August 2012, students have won two World Championships, four World Open Championships, 38 national titles and many other major titles. Webster students have won more major titles during the past four years than all other collegiate chess programs in the U.S. combined.